The Kingdom of Scotland's Darien scheme was the result of an inspired idea to found a colony on the Isthmus of Panama. Back in the late 17th century, this would have allowed goods from the Pacific to be quickly traded across the Atlantic (and vice versa), and it seemed a fortune was there for the taking. Regrettably the adventure was beset by disease, shortage of supplies, the unremitting hardships of the jungle, and the Spanish! After all, they were trying to build a trading hub right in the middle of Spain's Empire. 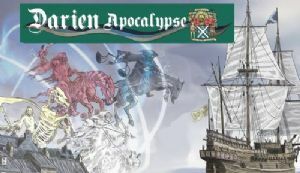 Darien Apocalypse is Ragnar Brothers' second Quantum game, and it features four similar but different worlds together with the four Horsemen of the Apocalypse. One world may prosper, whilst another suffers deprivation. Scots are enlisted, ships sail, lands are explored. The original Caledonians managed to build a small encampment a fort and a watch tower. So buildings feature and drive the game, providing goods to raise more capital and special abilities to help build the colony and counter the Horsemen threat. This game can be played co-operatively or competitively. It feels like a struggle — it was a struggle!